A delicious healthy twist on enchiladas. Beef is replaced with ground turkey and zucchini is used in the filling to bulk it up without sacrificing any flavor. 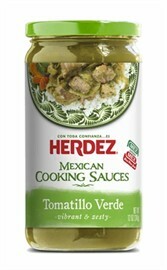 The addition of Herdez® Tomatillo Verde Mexican Cooking Sauce makes this dish easy and takes the flavor over the edge. Your family will never know they are eating healthy! One of this month's assignments for the AR Ambassador program was to develop a recipe (or two) using new Mexican cooking sauces from Herdez ® (Disclaimer: I received these sauces for free to review from AR and Herdez ®. The opinions, recipe, and pictures are mine and I have not been compensated for them other than receiving product samples.) My package included two of the four new sauces which currently have limited availability in California retail stores but can be purchased over the internet from anywhere. Herdez ® plans to roll out the sauces nationally sometime this summer. One of the sauces I got in my package was the Tomatillo Verde Mexican Cooking Sauce. The Tomatillo is a staple in Mexican cuisine. Its green color and tart flavor are its most distinguishing features. A vibrant and zesty blend of tomatillos and chilies combined with a hint of cilantro give our Tomatillo Verde Sauce its complex flavor and medium heat. Ingredients: Tomatillo, Water, Jalapeno Pepper, Iodized Salt, Soybean Oil, Dehydrated Onion, Coriander, Garlic Powder and Xanthan Gum. I loved this sauce. It has just the right amount of heat and worked great in the dish I created. I also loved that this sauce is made from natural ingredients, is low in calories, and low in fat. I have to admit, this is the first time I have ever used any products from Herdez ® and I know it won't be the last. I've been adding shredded zucchini to my enchiladas for some time now. Not only does it give you another way to get veggies, the zucchini really takes on whatever flavors you add to the dish because it's so mild, and bulks up the filling without adding a ton of fat and calories. It also bumps up the overall fiber, which is a plus. 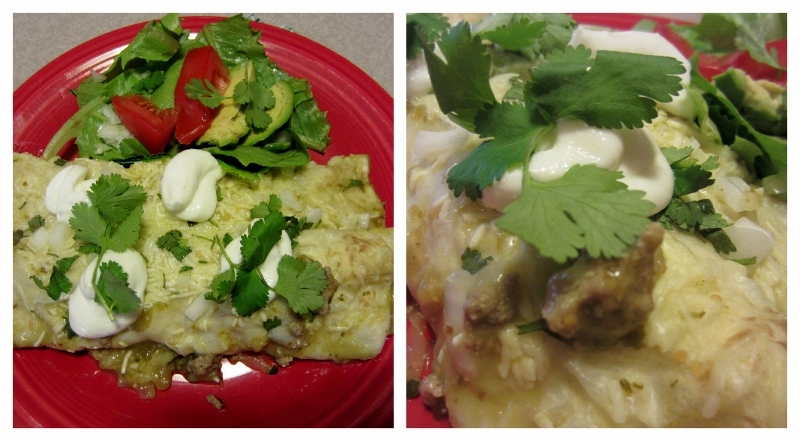 I don't like my enchiladas to be dry, so I used 2 jars of the Herdez ® Tomatillo Verde Mexican Cooking Sauce in this recipe to both help flavor the filling as well as serve as the sauce for the enchiladas. This cooking sauce is so versatile. Preheat oven to 375° F. Spray a 13"x 9" baking dish with cooking spray Pour 1 cup of the Herdez ® sauce on the bottom of a baking dish. Next make the filling. Just saute some onions and garlic. Brown up the ground turkey. Add spices and 1/4 cup of the Herdez ® sauce. Assemble the enchiladas by putting about 1/3 - 1/2 cup of the filling down the center of a flour tortilla. Top with 2 TBS shredded cheese and roll up. Place in baking dish seam side down and repeat with all the tortillas. Pour remaining sauce on top of the enchiladas and sprinkle with remaining cheese. Cover with foil and bake for 30-35 minutes. When done, remove foil and garnish with chopped onions, cilantro and sour cream. Preheat oven to 375 degrees F. Spray a 9 x 13 x 2 inch casserole dish with cooking spray. Take 1 cup of cooking sauce and spread it evenly on the bottom of the dish. For enchilada filling: In a large nonstick skillet, sprayed with cooking spray, saute 1 cup onions for about 5 minutes or until translucent. Add in garlic and cook for another minute or so. Add in the ground turkey and cook until browned, breaking it up as it cooks. Next, add in ground cumin, salt, chopped green chiles, cayenne (if using), salt, zucchini and 1/4 cup cooking sauce. Mix well and take off heat. To assemble enchiladas: Take one flour tortilla and, in the center, put about 1/3 to 1/2 cup of turkey-zucchini mixture down the middle in a strip. Place about 2 TBS of cheese on top of turkey mixture and roll up. Place in prepared casserole dish with seam side down. Repeat with remaining tortillas, placing them in the pan side by side. Pour the second jar of sauce on top of the enchiladas, coating them evenly with sauce. Sprinkle with remaining cheese. Cover with foil. Bake for 30 -35 minutes in the preheated oven, or until the sauce is bubbly and the enchiladas are warmed through. Garnish with chopped onion, cilantro, and sour cream, if desired. *Please NOTE this information was calculated using La Tortilla Factory-Low Carb Tortillas and full fat Monterey Jack cheese. If you use other products than those, the values may change. You can cut back on the fat and calories by reducing the amount of cheese and using reduced fat cheese, if you wish. Nutrition information DOES NOT include garnish. The two sauces I was given were both a hit! I want to try the two I didn't get and will probably be ordering them for myself from Mexgrocer.com in the near future. My family loves Mexican dishes and these sauces make it so easy...and they are delicious. I really enjoyed this AR assignment this month. I will share with you my second recipe using the other variety of sauce I got next week. I sort of went outside the box, so to speak, and made a cake! Products received from advertiser are only used for experienced-based reviews on mykitchenadventures. The reviews, content and opinions expressed in this blog are purely the sole opinions of Renee@MKA. This blog was written in support of Herdez® and their Product or campaign. I absolutely love enchiladas. I will definitely have to try this one. I make a tomatillo verde so I will use that. I like that you lightened this dish up and I know the hubs will actually eat this! :) Have a great weekend! Hi Renee, these look amazing. I don't think we get that brand here, but I can find something similar and will give it a try. Have a great Friday! Hi Marion! so glad you found me! I added a link to your blog to my blogroll last week! Love your blog!